Climate Scientists have been lying, cheating and changing statistics for years in order to collect a rich livelihood. A careful look at the early 20th century global warming, which is almost as large as the warming since 1950. Until we can explain the early 20th century warming, I have little confidence IPCC and NCA4 attribution statements regarding the cause of the recent warming. This is an issue that has long interested me. Peter Webster wrote a previous post Mid 20th Century Global(?) Warming, which focused on the warm bump that culminated in the 1940’s. My interest in this period was reignited while working on my report Sea Level and Climate Change. Then, the recent paper by Zanna et al. discussed in Ocean Heat Content Surprises further made the wheels turn. This paper ‘shocked’ me for several reasons. First, I can’t imagine how I missed this paper when it was first published in Oct 2017 – apparently it received no publicity (oops now I remember, this was when i messed up my neck/shoulder/hand). Second, every time in the context of an attribution argument that I say ‘but the early 20th century global warming (not to mention the mid century cooling) and all those heat waves and droughts,’ I (along with my argument) am dismissed. I will paraphrase something I recall Gavin Schmidt saying: “We understand the late 20th century warming and have good forcing data, so no point to paying attention to the early warming where the data is far inferior.” And last but not least, the AMO and PDO are explicitly considered in Hegerl et al.’s attribution argument. The Hegerl et al paper is actually pretty good (as far as it goes). Lets take a closer look at their analysis and argument, then I will take it a bit further. Hegerl et al. provides a summary of forcing from CO2, volcanoes and solar (Figure 4, below). In 1910, the atmospheric CO2 concentration has been estimated to be 300.1 ppm; in 1950 it was 311.3 ppm; and in 2018 it is 408 ppm. So, the warming during the period 1910-1945 was associated with a CO2 increase of 10 ppm, whereas a comparable amount of warming during the period 1950 to 2018 was associated with a 97 ppm increase in atmospheric CO2concentration – almost an order of magnitude greater CO2 increase for a comparable amount of global ocean warming. Back when CO2 concentrations were lower, each molecule had a greater radiative impact – but not THAT much. Clearly, there were other factors in play besides CO2 emissions in the early 20th century global warming. In terms of external radiative forcing (Figure 4, above), a period of relatively low volcanic activity during the period 1920-1960 would have a relative warming effect, although the period from 1945 to 1960 was a period of slight overall cooling. 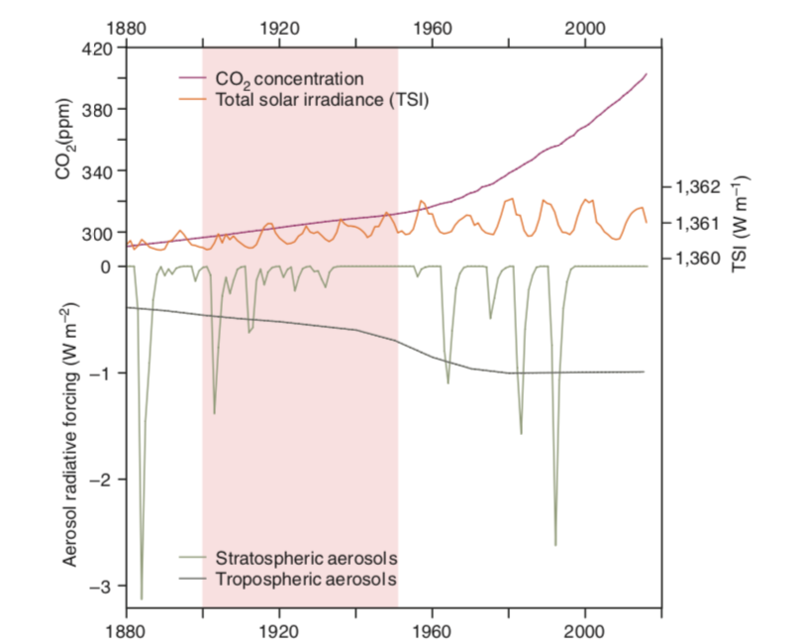 Solar forcing in the early 20th century is uncertain, with estimates of warming of varying magnitude, although the magnitudes are insufficient for solar to have been a major direct contributor to the early 20thcentury global warming. Exactly how Hegerl et al.come up with 40-54% attribution to external forcing isn’t clear. My own back-of-envelope calculations suggest a smaller number. Hegerl et al. analyzed the internal variability associated with ocean circulations during the period since 1900. They found that the unusual cold anomaly circa 1910 originated in the South Atlantic, and then spread globally in the subsequent decade, leading to cold anomalies in both Atlantic and Pacific. This is very interesting, and something I hadn’t seen before. This rarely discussed cold period was followed by strong warming in the Northern Hemisphere, which was particularly pronounced in high latitudes. Hegerl et al. summarized some previous research that might account for mechanisms of the strong high latitude warming in the Northern Hemisphere, including multi-decadal ocean oscillations. Hegerl et al. focus their arguments regarding internal variability associated with large-scale ocean circulations on the Atlantic Multidecadal Oscillation (AMO) and the Pacific Decadal Oscillation (PDO). Warm phases of the both the AMO and PDO contributed to warming particularly during the 1930’s and 1940’s. They also consider atmospheric circulation impacts from the Pacific Walker cell, North Atlantic Oscillation and Arctic Dipole Model. Let’s look at the data. First the surface temperature data. It is instructive to consider land and ocean separately, and also to look at the hemispheres separately. Note, Berkeley Earth land values are lowest circa 1910 (of the values plotted above, I suspect Berkeley Earth is most reliable over land in early 20th century). I would be interested in a better diagram that also includes Cowtan and Way (the Arctic was very warm in the 1920’s and 1930’s), but I am not seeing much in the way of land-only comparisons. Perhaps Zeke, Cowtan, or Robert Rohde has a better diagram. 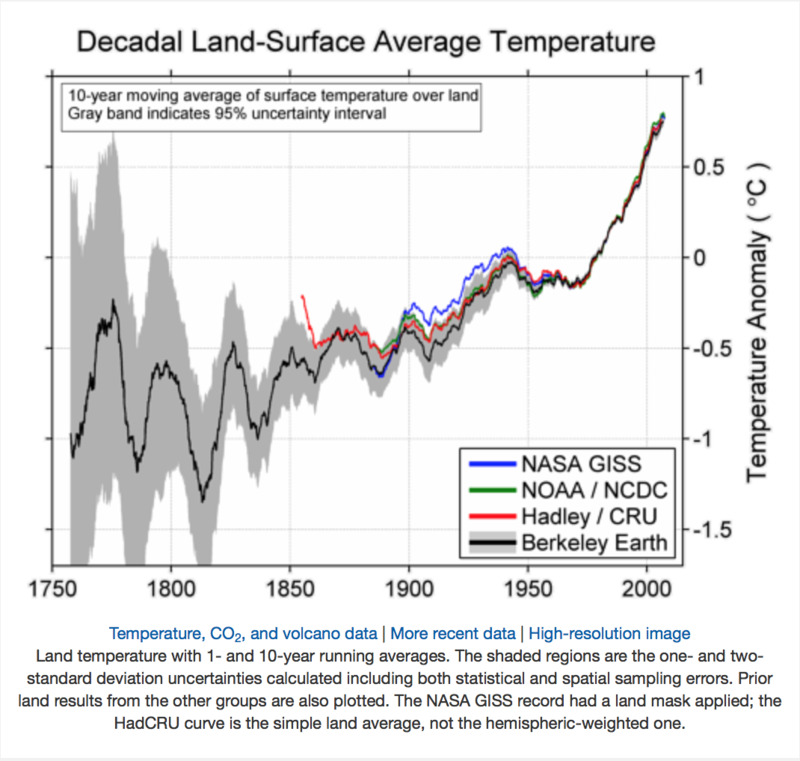 Note: over land, the recent warming is substantially greater than the early 20th century warming. The 1910 cold anomaly is larger in the SH, but seems coincident with the timing of the NH cold anomaly (I have NO IDEA what kind of data ‘adjustments’ were made during this period, but i do know that data was very sparse in the Pacific and SH oceans during this period). But globally, you can see that the ocean warming between 1910 and 1945 was about the same magnitude as the warming from 1976 to present (recent warming is smaller in the SH). The dip circa 1910 starts at the surface, and is seen in the deep ocean circa 1925. The recent sea level rise is believed to have started in the mid-19th century (prior to these graphs. Consideration of the rates of sea level rise in the early 20th century shows an increase in the rate of sea level rise starting in 1920 and peaking in the 1940’s. 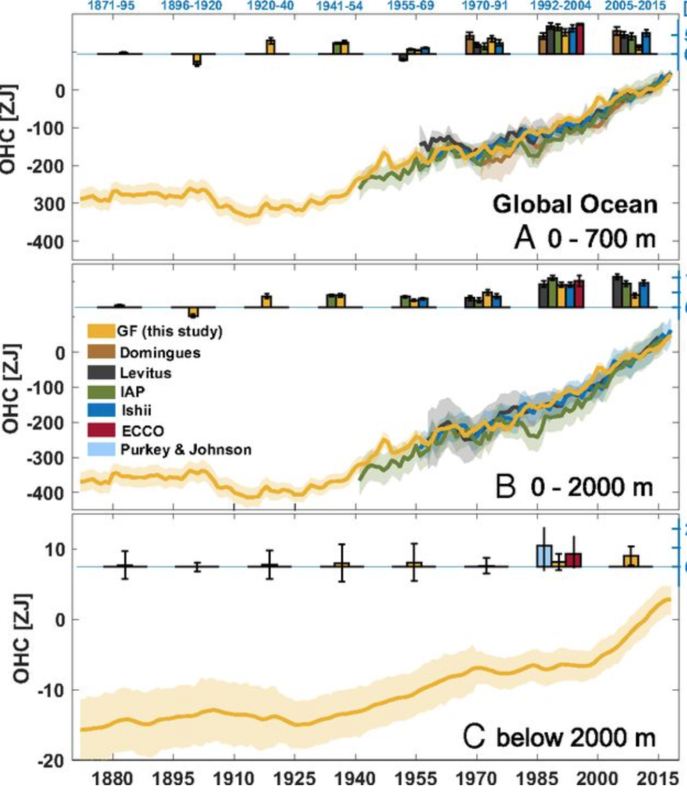 Clearly, ocean heat content is not the only thing driving sea level rise. The Arctic warming began in 1915, with an increase of about 1.6 C between 1915 and 1940. The impact of the early 20th century Arctic warming is seen in the negative mass balance for Greenland, from the 1920’s to mid 1950’s. This Greenland mass loss is consistent with the increase in the rate of sea level rise circa 1920 – 1950. While early estimates of Greenland mass balance are associated with substantial uncertainty, the early century mass loss is consistent with the early 20th century Arctic warming and increasing rate of sea level rise. There are too many independent lines of evidence to ignore the early 20th century global warming. 1) an estimate of internal variability is derived from multi-century to multi-millennial climate model simulations without external forcing. However the climate models have substantial deficiencies in simulating multi-decadal internal variability (e.g. Kravtsov et al) with regards to magnitude, spatial patterns and their sequential time development (and this is not to mention centennial to millenial scale internal variability). 2) Based on these model calculations of internal variability, they infer that the warming since 1950 exceeds the magnitude of natural internal variability . 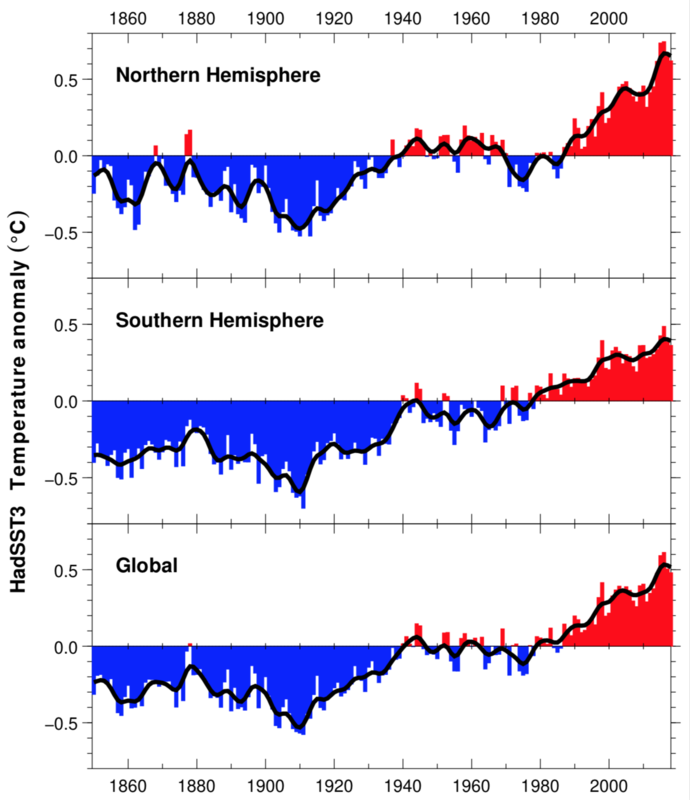 Therefore you cannot explain this warming from natural variability alone. 3) They then look at climate model simulations for the 20th century, with internal variability averaged out, so all you see is the forced response. And ‘miraculously’, the forced response ‘sort of’ agrees with observations. Therefore we are justified in assuming that all the warming is ‘forced’ (oops spot the flawed logic 2 –> 3). The “fingerprinting” approach used by Hegerl et al. ignores the fingerprints of multi-decadal variability; multi-decadal variability is only invoked when the forcing is insufficient to explain the observations. This attribution ‘sort of’ works, according to the principle that two ‘wrongs’ make a ‘right’ – neglect of multidecadal and longer internal variability plus climate model sensitivity to CO2 that is too high = 100% attribution of recent warming to anthropogenic causes. As summarized in my sea level report: In general, years with positive AMO index are associated with relatively high Greenland runoff volume and vice versa (Hanna, 2013; Mernild and Liston, 2012; Mernild et al., 2017). Hofer et al. (2017) found that the reduction in Greenland’s mass balance since 1995 is caused by decreasing summer cloud cover, which has a warming effect from increased solar radiation. The observed reduction in cloud cover is strongly correlated with a state shift in the North Atlantic Oscillation (NAO), promoting high-pressure conditions in summer that inhibits cloud formation and also reduces precipitation.So what we have is some very fine research on multi-decadal to millennial scale internal variability by Xie et al., Kravtsov, Huybers et al., Meehl et al and others. And it all gets ignored by the circular reasoning of formal attribution studies. In order to have any confidence in the IPCC and NCA attribution statements, much greater effort is needed to understand the role multi-decadal to millennial scales of internal climate variability. Much more effort is needed to understand not only the early 20th century warming, but also the ‘grand hiatus’ from 1945-1975. Attempting to attribute these features to aerosol (stratospheric or pollution) forcing haven’t gotten us very far. The approach taken by Xie’s group is providing important insights. Once we do satisfactorily explain these 20th century features, then we need to tackle the 19th century — overall warming, with global sea level rise initiating ~1860, and NH glacier melt initiating ~1850. And then we need to tackle the last 800 years – the Little Ice Age and the ‘recovery’. (See my previous post 400 years(?) of global warming). The mainstream attribution folk are finally waking up to the importance of multidecadal ocean oscillations — we have barely scratched the surface re understanding century to millennial scale oscillations, as highlighted in the recent Gebbie and Huybers paper discussed on Ocean Heat Content Surprises. There are too many climate scientists that expect global surface temperature, sea ice, glacier mass loss and sea level to follow the ‘forcing’ on fairly short time scales. This is not how the climate system works, as was eloquently shown by Gebbie and Huybers. The Arctic in particular responds very strongly to multidecadal and longer internal variability, and also to solar forcing. Until all this is sorted out, we do not have a strong basis for attributing anything close to ~100% of the warming since 1950 to humans, or for making credible projections of 21st century climate change.